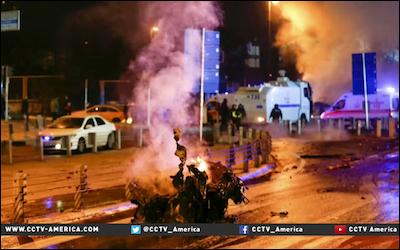 Two December 10 bombs in Istanbul killed 44 people and injured more than 150. Turkey can sometimes look like a bad joke. Turkey sits in the lowest ranks of any credible index measuring press freedoms and the rule of law. Reporters Without Borders, for instance, in its 2016 report, put Turkey into the 151st place out of a list of 180 countries -- ranked below Pakistan, Russia and Tajikistan. In this year's Rule of Law Index, released by the World Justice Project, Turkey ranked 99th out of 113 countries, scoring worse than Nigeria and Myanmar. Turkey's leaders, nevertheless, recently condemned the state of press freedoms in Europe and the United States. An official statement claimed that press freedoms had a problematic and restrictive state in "Western democracies such as, France, Germany, England, Sweden, Spain, Netherlands and the USA." But not all Turkish news is equally amusing. On Dec. 10, a twin bomb in Istanbul killed 44 people and injured more than 150. The perpetrators were an urban branch of the Kurdistan Workers' Party (PKK), which has been fighting for a Kurdish homeland since 1984. The conflict has already taken nearly 40,000 lives. Turkish President Recep Tayyip Erdogan himself announced the more recent bloody picture. Calling for a "national mobilization against all terrorist organizations," Erdogan said that 1,178 people have been killed since July 2015 in Turkey's fight with the PKK. Bomb attacks by the Islamic State (ISIS) claimed another 330 lives. Those numbers exclude 248 people who died during the bloody coup attempt of July 15, as well as 9,500 apparent PKK members who were killed by Turkish security forces. Turkey also claims that it killed 1,800 ISIS members since July 2015. Turkey's Kurds have been demanding a homeland since the 19th century. These numbers put the total death toll at 13,056 in a span of less than 17 months. This is not a winning war for any party. From the point of view of asymmetrical warfare, Erdogan's struggle looks futile. If, in Erdogan's numbers, Turkey has killed 9,500 PKK fighters in 17 months and the organization is still capable of striking the heart of Turkey's biggest city, Turkey's security and intelligence officials might wish to rethink their warfare strategy. More importantly, politically, Turkey's diagnosis is problematic. Erdogan claims that terror keeps taking lives in Turkey merely because "dark external forces were acting against Turkey's interests." In Erdogan's laughable narrative, the entire world of major powers has united to conspire against Turkey, solely with the aim of stopping the rise of this Muslim nation where per capita GDP is less than $10,000. The goal of this allegation is to keep a majority of Turks united behind their beloved leader. But it has not, and will not, solve Turkey's decades-long dispute with its Kurdish minority. Turkey's Kurdish problem is not a military one. On the contrary, the military aspect of the problem is the consequence, not the root cause. Turkey's Kurds have been demanding a homeland since the 19th century -- long before the modern Turkish state was born in 1923. Both the Ottoman and Turkish states, however, have viewed the Kurdish problem as a military matter that should have a military solution. They have been wrong. It is time that Ankara rethinks its diagnosis about the Kurdish dispute. The Turks can start by asking themselves why their Kurdish compatriots choose to live in mountainous hideouts, fight, kill or be killed. They have a sentimental, romantic longing for a homeland. Erdogan's theory, that the evil West is trying to stop Turkey's rise, fails to explain any of the several Kurdish uprisings during a failing Ottoman Empire and a newborn, poor republic. Turkey's Kurdish problem is a political one. It can only be solved through political means, most notably through peaceful negotiations. Otherwise, many more days of national mourning will be awaiting Turks and Kurds. Burak Bekdil is an Ankara-based political analyst and a fellow at the Middle East Forum.